We just recently covered a story about the One Laptop Per Child (OLPC) program receiving Windows XP, and it appears a new upgrade may be in place. As you can see by the picture, the proposed next-generation XO-2 is a laptop anyone would be proud to own. The XO-2 uses two touchscreens, and is half the size of the original environmentally-friendly XO laptop that we have all come to appreciate. 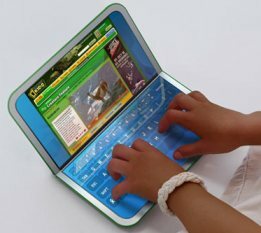 I guess someone is trying to introduce the OLPC program to Asus Eee type laptops, or UMPCs. Other features on the XO-2 include bright displays that are usable in sunlight, and can toggle between vertical, horizontal, and tablet displays. All of this works on the very low power of just one watt. Either way, the XO-2 is definitely made to face the future of computing. If we ever do get one laptop per child, I imagine that would be a future where computers looked like the XO-2. In fact, I want one of these touchscreen sandwich laptops. Unfortunately, the XO-2 probably won’t be available until 2010, and there is rumor of a very low price tag of only $75. At this rate, it would be cheaper to buy one of these computers then fill up your tank with gas.